Preschool Science: Let's Make Charts! While I enjoy making things with Chuck, I'm also always looking for easy ways to incorporate mathematics and science into our daily activities too. I loved math and science as a child, so I'd love it if he appreciated those subjects too. Since he's only 3, our activities have to very pretty hands-on and relevant to his interests (like our shape dice, cardboard bridges, and shape touch and find activities.) We love taking walks outside. 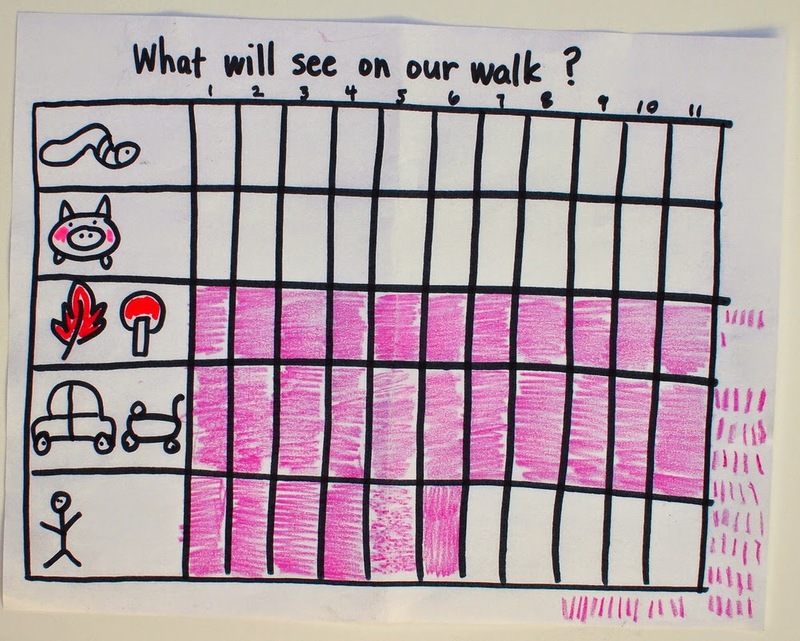 So I incorporated science and math into our walk and created this chart to help us count the number of different things in our neighborhood. 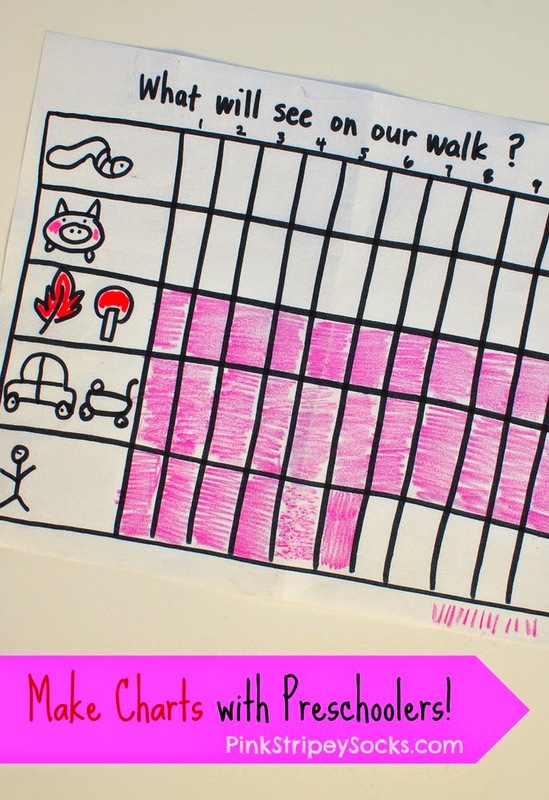 STEM ACTIVITY: Make Charts With Preschoolers! This was a super easy STEM (science, technology, engineering, and mathematics) activity to do with my preschooler. It required very little prep and we practiced our observation, counting, and data analysis skills in the process! Here's how we did the activity! 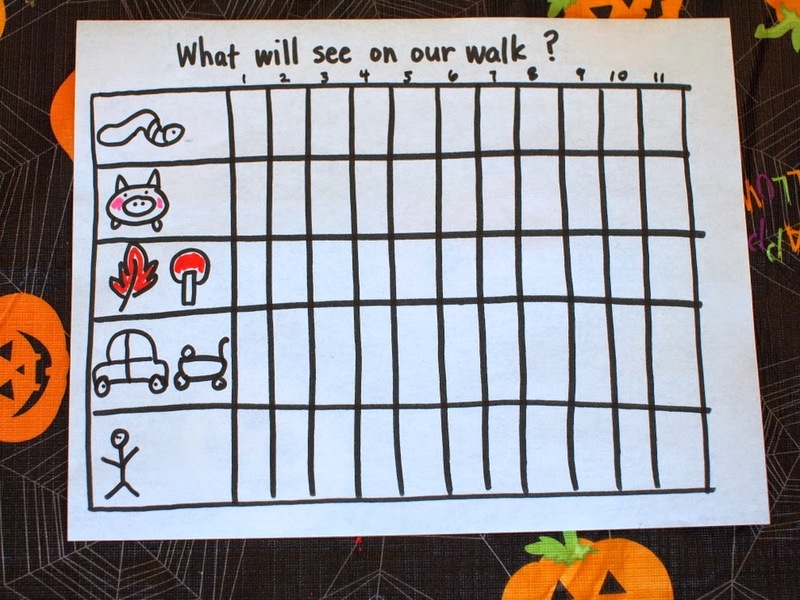 First I explained to Chuck that we were going on a walk and we wanted to create a chart so that we could remember and count the different things that we saw in our neighborhood. Then we looked at the list and tried guessing what we would see the most of and what we would see the fewest of. (I know. This question was worded terribly, and he had difficulty understanding what I was saying. I then tried using the phrases "a lot of" and "not very many of.") I then recorded our hypotheses on our paper. Then I created a data collection chart to help us record and then visually see our findings. 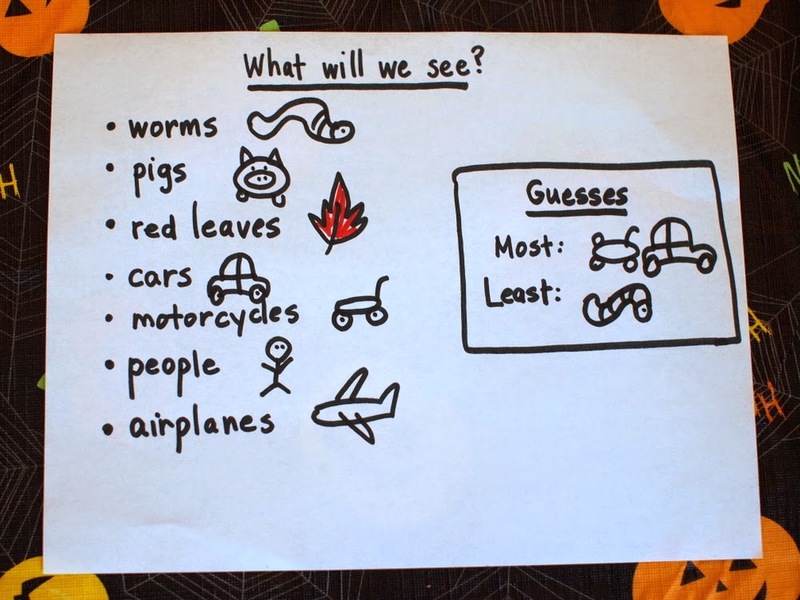 Since I didn't have very much space on our paper, I chose 5 categories for us to record: Worms, Pigs, Red Trees, Moving Cars/Motorcycles (no parked vehicles included), and People. Then we took our chart and a crayon and set out to collect some data. Right away I realized that I should have brought a clip-board and used stickers instead of a crayon. It was hard coloring a floppy piece of paper. Plus, Chuck and I are still working on coloring in the lines... so stickers would have been easier for him to maneuver. So I ended up coloring in the boxes and making tally marks for both of us. Even though I was the one who actually marked the chart, Chuck was fully engaged and present in the activity. This was super surprising to me. I was doubtful that he would even care to count things on our walk, but he loved it! He really enjoyed looking for the different items, especially the red trees and cars. Every time a car drove past he would point them out to me! And once we reached the end of our chart and I started using tally marks, he kept crying "Wow! Wow!" whenever another car drove by. Use stickers: Data collection occurs so quickly, it was silly of me to expect Chuck to quickly color in boxes. Next time I will use stickers. Use a clip board: Having a firm surface would have also helped with data collection. Looking for other easy and fun science activities to do with your Preschooler? 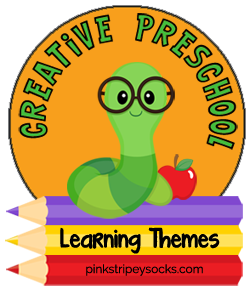 Here are 4 great Science activities from the other Creative Preschool Collaborators!